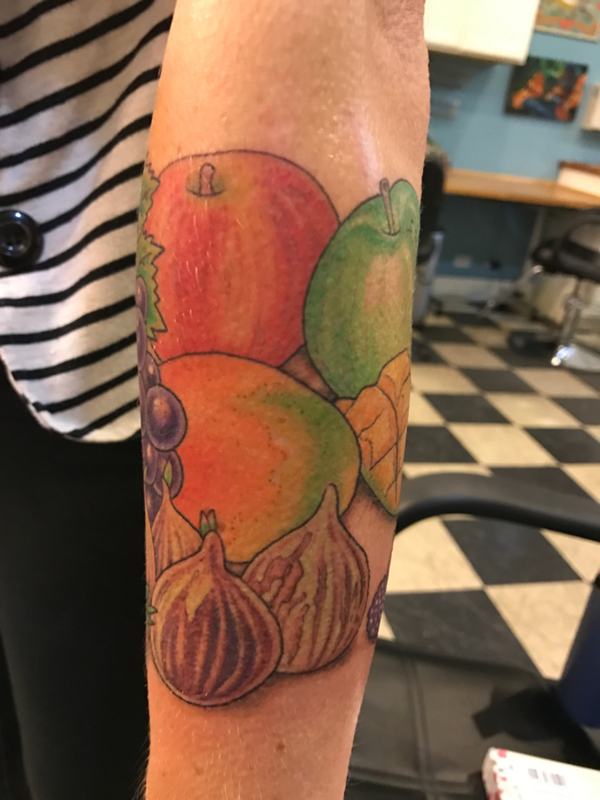 Root for Fruit — Ginger writes. The day I sat there for nine hours in the company of Rob, Jared, and Sue was the day I read an entire Taylor Swift biography magazine and almost all of Jenny Rosenstrach's new book How to Celebrate Everything. There was much to celebrate. At the end of the day, my tattooist Rob even gave me a bottle of his homemade Cabernet Sauvignon to take home on the airplane. It was the weekend of the Chicago Marathon, and two friends came in for small matching fir trees. The one friend had traveled from Portland to run the race and to visit the Chicago friend. Since high school, these girls had dreamed of this day, a day to celebrate the permanence of a relationship that will never fade, an evergreen ode to friendship. They were giddy with excitement, which Jared met with artistic sincerity and a skilled hand. A gal came in with two of her own drawings, a funny-looking cat and a house on fire. The odd cat went on the girl's upper arm, to meow her art to the world. Then the girl let Sue fill the landscape of her lower arm with a little house on fire that was preceded by the same house not on fire. Sue explained it to me later: "If you don't have this [house not on fire], then you can't have this [house on fire]." I think, "If you don't have this tattoo, then you wouldn't understand." A big and awkward young man got his very first tattoo, two Chinese symbols on his left wrist. I didn't ask what they signified. I only was so happy that Sue put him at ease in his newness and was so kind to him. 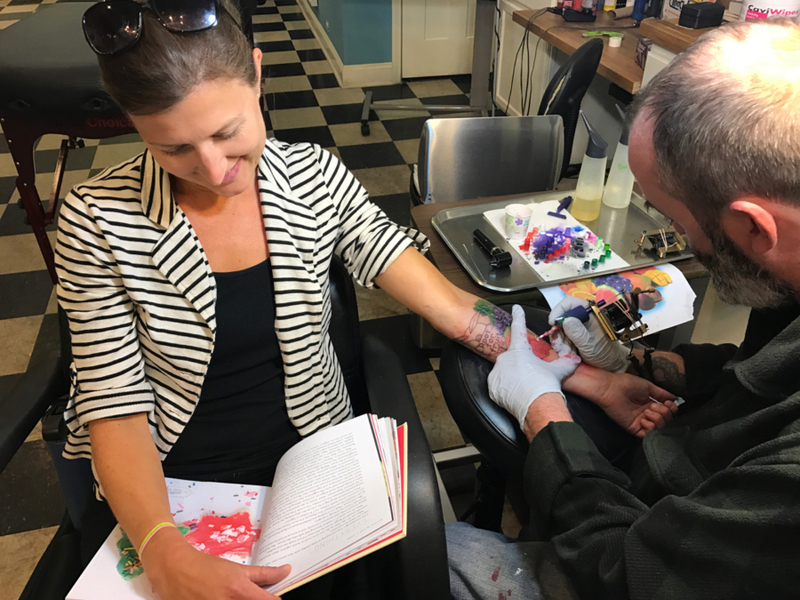 A tattoo parlor can be a rough and rowdy place, full of profanity and opinionated views both daunting and tiresome. You might think you want to run away, except for realizing there is no other way to get this done. How thankful you are for the small considerations in the irreverential mix. The generosity to procure a street parking pass in order to avoid feeding a meter every two hours. The Johnny Cash selections. The bathroom breaks. The freedom to read and read, or to sit in the buzzing silence. The dinner break and the walk-down-the-block break. The simple asking along the way if you're okay. Okay, I feel good. And okay, I'm really doing this. Rob walked two blocks home to grab his dinner and the bottle of wine for me. I ate my cold eggplant parmesan from the previous night's dinner at Maggiano's. Jared and Sue told vampire jokes after the Chinese-symbol guy left. Jeopardy-style, the quest was on to find the right question for Jared's vampire-joke punchline: "Because he needed to go to the bat-room." When asked for my best attempt, I chimed in with, "Why did the vampire raise his hand to be excused from class?" I should have said, "Why did the vampire take a break from getting his new tattoo?" I know that's why I took breaks, because I was in the process of drinking a whole liter of Smartwater. Talk about toxins. After dark, a small family came in with a too-tired three-year old. The mom asked for three tiny stars, outlines only, to represent her daughter's favorite number. "There will only be the three of us, forever," she said. It took the same amount of time for Jared to plot the stars in their fixed positions on the lady's forearm as it took him just a few minutes later to carefully apply the little girl's temporary tattoo, a pretty pink bow. And seven hours in, on Rob worked. He focused his eyes again and again. He mixed more paints, tore more paper towels, and was a perfectionist to the end. When he got done, he said he won't really be done until I come back for touch-ups. He wants to see how the cover-up heals and to work more shadowing into the design to achieve lifelike coherence. He may add another apple or more berries for balance. To do something so permanent, to take my love for a thing to this extreme requires a kind of commitment and diligence that occasionally feels foolish. Do I really want fruit right there and forever? Oh, but I do. This is a good and true part of my story. For you see, underneath is a trust in the captain and a trust in the crew. Do you realize how much my heart loves and desires watermelon and grapes and figs? 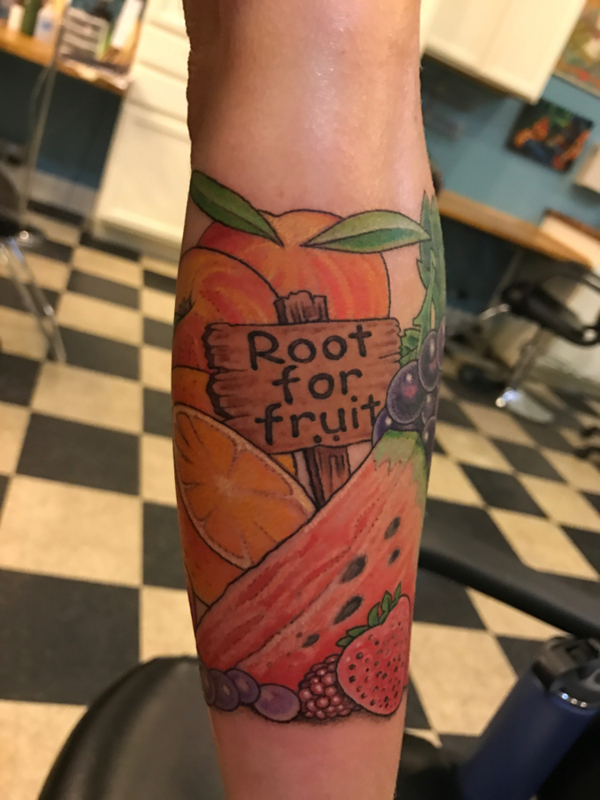 I root for fruit most sincerely. And I believe that is how God roots for us. I read a verse in Hosea not long ago that convinced me of this. It says that God's seeking for us and God's finding us are like the discovery of fruit that has been waited for and longed for. Do you realize how crazy I'd go for grapes if I was trekking through the dry and dusty desert for a while? Or how mightily I would desire and reach for that very first ripe fig in my fig tree's very first season? Even when I'm just living my nice air-conditioned life on the lake and have only to open my fridge for fruit, I still go crazy for grapes. Even with two mature fig trees dangling their fruit in my yard for months, I am still ever so keen to get those sweet juicy treats in hand. Could God really love and want us in that same way? Would God be so bold as to have our names tattooed on his arm because of his untiring love for us? My tattoo is my visual for chasing a dream, overcoming obstacles, trusting the process, taking a risk, loving what God made me to love, and knowing a God who roots for me even more than I root for fruit. Thank you, Rob, for doing what you do so well, for loving your craft, for putting me at ease, for working so diligently, and for being the guardian of my dreams.